Your average service technician faces a variety of dangers. Electricians risk electrocution, mechanics risk bodily injury — even plumbers can suffer the effects of lead and asbestos exposure. While these hazards can certainly do a lot of harm, they don’t quite compare to the demands of wind turbine repair and maintenance. The best way to understand the risks involved with being a turbine maintenance technician — or skyworker, as they’re often called — is to take a look at the tasks they’re being asked to perform. Let’s get started. The most noticeable aspect of these towering turbines are their blades; they also happen to be a significant source of trouble. Many wind turbines are placed in or on coasts to take full advantage of the powerful winds produced by the ocean, but this, unfortunately, exposes them to salt from the spray. Once salt particles attach themselves to turbine blades, it’s easier for other particles — such as dirt — to collect and build up; as the blades get heavier, it takes more power to keep them moving, which means one minuscule salt particle can end up decreasing the turbine’s power output by up to 15% if they aren’t constantly cleaned and cared for. It isn’t only the outside of the structure that must be cared for. Wind turbines possess simple yet nuanced components within the nacelle (the horizontal piece that sits atop the vertical tower) such as the gear box, low- and high-speed shafts, generator, controller, and brake. 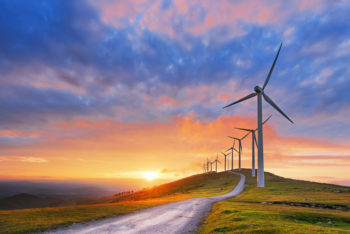 Since these mechanical bits are responsible for harnessing the energy produced by the wind, as well as controlling the blades if the winds are too slow or fast, it’s vital that they not accumulate any contaminants. Just as you must change the fuel filter in a diesel engine to keep out impurities, you must routinely change the air filter in wind turbines; otherwise, blowing sand, dust, rain, and salt fog could enter the nacelle and disrupt the electrical systems, causing failure — an extremely expensive problem. However, wind turbines can also fail and incur damage due to a lack of lubrication. All of those mechanical and electrical components must be able to move fluidly, especially the gearbox, generator bearings, and blade bearings. Although we are in the process of developing drones to handle maintenance and repair work on wind turbines, we aren’t quite there yet. Skyworkers are relied upon to get the job done, and face a set of challenges (and hazards) unique to their profession. Harness: Blade cleaning and repair requires skyworkers to essentially dangle in midair. The obvious risk involves the extreme height, so harnesses are used to ensure they are safely attached to the ropes that hold them in place. At the same time, harnesses allow various accessories that they need to complete the job to be within reach. Eyewear: The dangers of glare, fog, and scratches are severe at such heights. Because they can come from all angles, it’s crucial that your safety glasses have built-in side shields, possess a grade-2 impact rating, and offer protection against 99% of UVB rays (special purposes lenses do this). Vertical Fall Arrester: When you’re hanging from ropes, you need a backup option in place to protect you from accidents. Vertical fall arresters attach to a separate rigid anchorage line which secures the skyworker while they move up and down the turbine tower. When it comes to routine maintenance, many wind turbines are serviced after their first 500 hours, and then annually. Neglecting one single aspect of your turbine care could result in damage or power failure, both of which are very costly situations. To protect your investment, it’s best to employ a skyworker to attend to your turbines on schedule.